The price of the new sixth-generation iPad didn't change in the United States compared to the previous fifth-generation model, but prices for the new tablet have been lowered in several other countries around the world. Prior to the launch of the new iPad, rumors had suggested it could be priced as low as $259 in the United States, which did not happen, but the price has indeed dropped slightly in multiple countries. 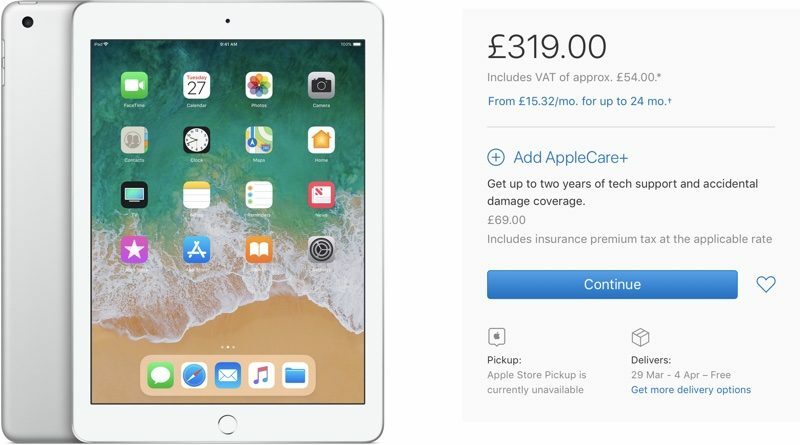 In the UK, for example, the entry-level fifth-generation iPad was priced at £339, with the new sixth-generation model available for £319. In Canada, the fifth-generation 32GB iPad cost $449, while the equivalent sixth-generation model is now available for $429. In Germany, France, and other European countries, the new iPad is priced starting at €349 to €369, down from €399 to €419. Prices appear to be lower in most, if not all European countries. Prices have not changed in all countries where the new iPad is available. In New Zealand and Australia, for example, prices remain unchanged, starting at A$469 and NZ$539, respectively. Prices have also not shifted in some Asian countries, including Japan, Singapore, and Korea, but prices are lower in others like China, and Thailand. In the United States, the entry-level 32GB sixth-generation iPad is priced at $329, the price as the fifth-generation model. A 128GB version is available for $429, while Wi-Fi + Cellular models can be purchased for an additional $130 over the standard Wi-Fi only price. Still ~ 10% overpriced in €, given the current exchange rate. Cost of doing business is higher in Europe. You can't have all the extra consumer protections, then also insist it should be the same price. I insist nothing. If I feel that a product is overpriced in my region/currency, I simply don't buy/recommend it. There are other big (American) tech companies that have appropriate prices in Europe, so there goes that argument. By the way, the 2 years of mandatory EU warranty have to be provided by the retailer, not the manufacturer. I know this event isn’t exciting for us Mac rumors regulars but, this new iPad is such a good deal for what it is, it makes me wonder what the profit margins are on it. Also, it goes to show you how overpriced iPhones are in comparison. Also need to offset those higher tax rates they pay over here... oh wait. iPad lineup is too confusing. Also of note is the iPad mini is $70 more expensive than the new iPad, yet it has an A8 (vs A10) and is a smaller device. Don't forget that we have different habits about sales tax : to be added in US, but included in most European countries. In France, the 359 € price tag for the entry model includes a 20% sales tax. Our base price is therefore 299 €, roughly 371 $ as of today. That's 13% over the US price, and we've seen much worse in the past ! There you go. 13% more expensive BEFORE taxes. That's ridiculous. So in the end it's about 30% more expensive than in U.S. states with no or low sales tax. You find that acceptable? And yes, maybe you should write Apple about our different "habits" concerning sales tax. I've never heard any European say "oh, this Apple product is only overpriced because we pay so much sales tax!". Guess what, there are countless products that are not 20% more expensive than in the U.S. because of our taxes. The iPhone (which is even more overpriced in €) has 28% market share in Europe, 50% in the States. This discrepancy is mainly caused by their prices, and I'm glad that there are millions of people out there who do not buy the overpriced garbage of this disgraceful, tax avoiding "company". (A) We're discussing the retail price, so that's still relevant, and (B) Apple is often the retailer itself. But anyway, that's just one example. When I visited Europe, almost everything was more expensive beyond just the exchange rate. Fuel, shipping, retail, food, cars, soda, electronics, electricity, taxes, generous employee benefits, etc etc. All of this raises the cost of doing business too.